Think it, see it, dream your design, or simply rely on the artist himself, Dimitri is a master craftsman of more than 25 years in his trade. He can guide you through your design options, visit you at home or in your business and help you pull together a unique look, using interesting materials, colours and options. Visit the Oistros workshop and you will find a den of eclectic pieces of work, with one off items and some regular standard classics. Look out for his own artistic pieces as Dimitri really brings flair and excitement to his work, which matches his workshops name....Oistros......'the energy of love'. 'Oistros' is the leading name in this field, here in Rhodes and around the dodecanese islands. Any of the designs you find design here, can be order and shipped to you anywhere in Europe. Here you will find photos of just a small amount of Dimitris work, in sections of interest, Beds, Lights, Tables and artistic creations.....be inspired and design you own ! 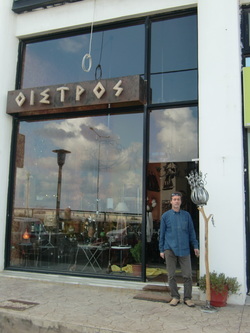 OISTROS workshop is close to the new marina and Zeferos beach. Just call Dimitri and he will meet you to show you where it is.